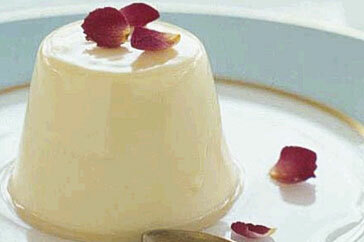 Salted caramel panna cotta - home cooked food delivered. We have taken this reliable favourite to the next level with a modern twist of a background hint of salted caramel flavour. Terrific dinner party treat. Ready to eat!!. If you wish to turn them out and pretend you made them, loosen around the edges of the panna cotta, sit in a little hot water for a few seconds and turn out onto a plate. Be patient it will come out.